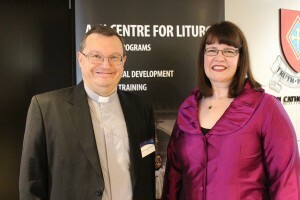 The Most Reverend Patrick O’Regan, Chairman of the Bishops Commission for Liturgy officially launched and blessed the new Centre for Liturgy at the Australian Catholic University on 21 November 2016. 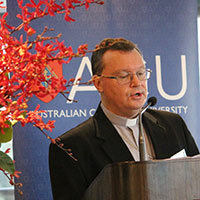 The launch took place during the Spring Plenary meeting of the Australian Catholic Bishops Conference in North Sydney. 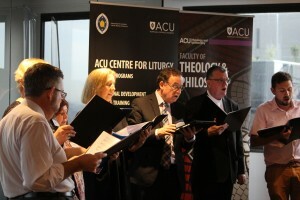 Bishop O’Regan said, ‘The launch of the ACU Centre for Liturgy also answer the question posed and the concerns expressed by many meetings and conferences liturgical about where the “Next Generation” of those trained in liturgy might come from and how they might be trained. ‘I remember several meetings convened by The Good Samaritan Sisters and Blessed Sacrament Fathers exploring a National Liturgy Institute. I remember the study they commissioned some years back into the need for tertiary study and pastoral training opportunities to be provided here in Australia. While this can never diminish the enriching nature of studying overseas, local accessibility and unhand expertise has always and remains one of such study’s greatest challenges. ‘I am delighted too by the model of co-operation that has emerged to meet this need. While it can read like an acronym soup when you list the major collaborators in this project: ACBC, ACU, NLC (National Liturgical Commission). It is an indication of the levels of co-operation and collaboration in this area. The ACU Centre for Liturgy can be such a place. ‘It is all well and good to have a dream of what ought to be done, however unless it is actually brought about then it will remain but a dream. Thank you to all those who have bought this dream to reality in the work of formation of the heads, hearts and hands who delight in the prayer inspired by the Holy Spirit that is placed on the lips of the praying Church. 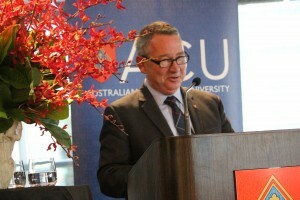 In particular Professor Greg Craven who took the lead in conceiving of and instituting the Centre, which he announced in March 2015 as a Vice Chancellor Priority Project, subsequently recruiting Dr Clare Johnson into the role of Foundation Professor and Director of the ACU Centre for Liturgy beginning in June 2015. This entry was posted in Uncategorized and tagged ACU Centre for Liturgy, Bishop Patrick O'Regan on November 28, 2016 by ACBC Communications.